Strange though it may seem, real-life disaster tends not to be a particularly fertile ground for the creation of disaster movies. Reality tends to either be too tame for entertainment or too horrific for imagining, plus it has the unfortunate habit of continually confounding any conventional narrative structure, through its dedication to happenstance and dumb luck. It's more of a challenge to build a decent story arc when historical accuracy dictates that the character you have spent time establishing has a date with destiny at prescribed stage in events. Yet take too many liberties and your film isn't worth a brass farthing: a disaster film can either trade on its creativity or its adherence to reality, there's really no in-between. Flight 90: Disaster On The Potomac's hands were tied from the beginning. The decision of whose stories to feature has already been taken by history, the ascription of the values that arose from them a done deal. The result is an odd mixture: the preamble is a bit boring, but only in the way that everyday life can be a bit boring. The drama is fraught and tense, but no more so than the historical event on which it is based. Essentially you are left with a compromise: either a news report with additional characterisation or a soap opera with limited dramatic license. The event on which the film was based took place in Washington DC in January 1982. Air Florida's Flight 90 was scheduled to fly from the capital to Tampa, Florida. The weather was as wintry as a January day in Washington is wont to be, and take off was delayed by an hour and three-quarters due to snow and ice. This was not good news for the real people involved in this incident but its value to the screenwriter cannot be understated: a delay is prime territory for expositional dialogue. Lives are fleshed out and the stakes made abundantly clear. Were I a normal person, I would surely have started to relate to these people, their hopes and dreams. Unfortunately for everyone involved, the pilots of Flight 90 were inexperienced at dealing with such arctic conditions and their failure to properly de-ice the wings prior to take-off led to the deaths of 74 of the 79 people on board. 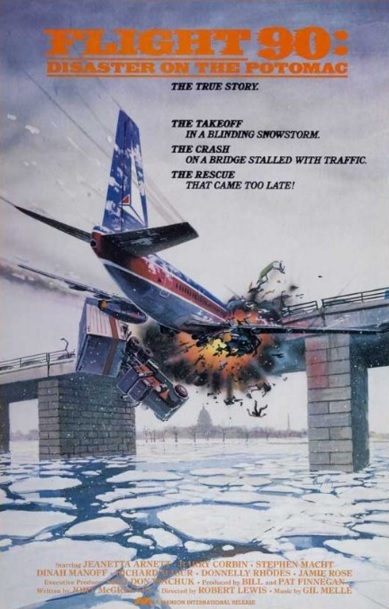 Their hobbled aeroplane failed to reach adequate speed on the runway, stalled and swiped into the 14th Street Bridge, killing an additional four people stuck on the ground in a snowbound Washington DC traffic jam. 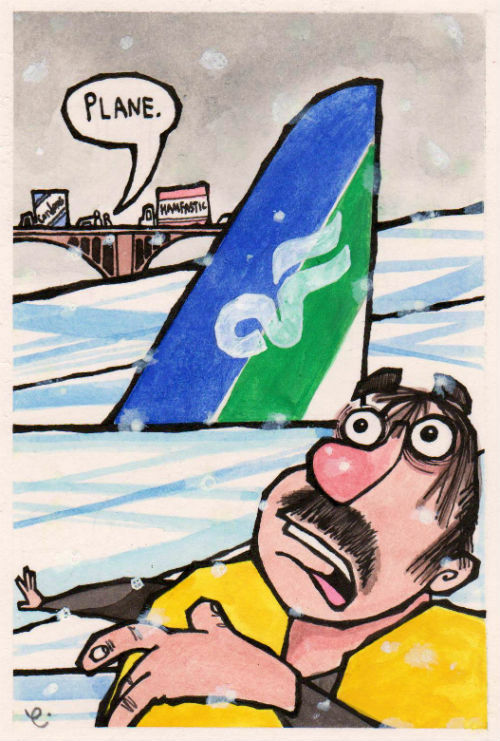 The Boeing 737 ended up in the frozen Potomac River below, as though it were nought but a common salmon. The stragglers bob to the surface and their battle for survival begins. The film is fairly formulaic, cheap and cheesy stuff but it makes a number of key decisions which perhaps raise it above other examples of its type. Most notable amongst these is the fact that the crash itself is not graphically reconstructed: a neat reminder that this is a character piece rather than a Hollywood blockbuster, that each of the characters you are watching was a person you might have bumped into on the street not two years before had life taken a few different turns. The fact that five of the people involved in the accident still were people you could bump into on the street is the film's real point for celebration, rather than any florid displays of special effects mayhem. It's an admirable decision, one which arguably costs the film in terms of its overall effectiveness but saves its soul. Alternatively you could forget everything I just said and look at the official movie poster. Cor lummy. It is not, by any means, a great film. It is not really a good film or a bad film, either. As a faithful account of a traumatic day and as a memorial to the good in humanity that such days tend to reveal, it does pretty much everything that you would assume it should. Flight 90: Disaster On The Potomac gets FIVE out of ten disaster points.